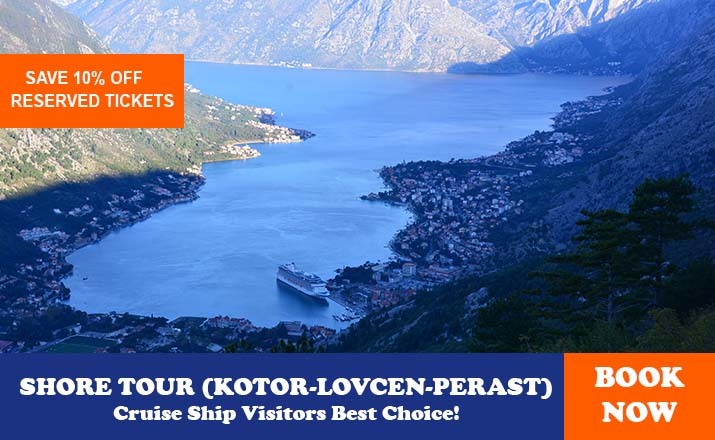 Except for a few locations, this part of Montenegro is off the tourist map for foreign travellers. One may add, unjustly, as it abounds with natural beauties, such as fast rivers and high mountains but also monuments from the previous centuries and villages. 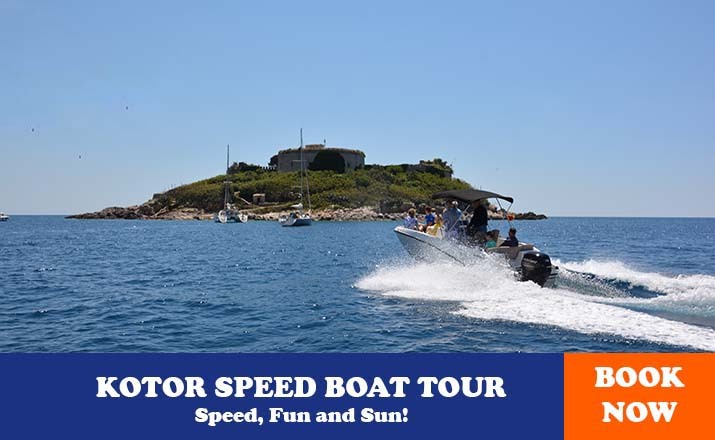 Most of these attractions are unexploited and visited only by an adventurous few. This is mostly due to the relative isolation of the region, the second reason lies in the fact that the large part of the region ranks amongst the poorest in Montenegro with underdeveloped infrastructure and derelict industrial facilities. 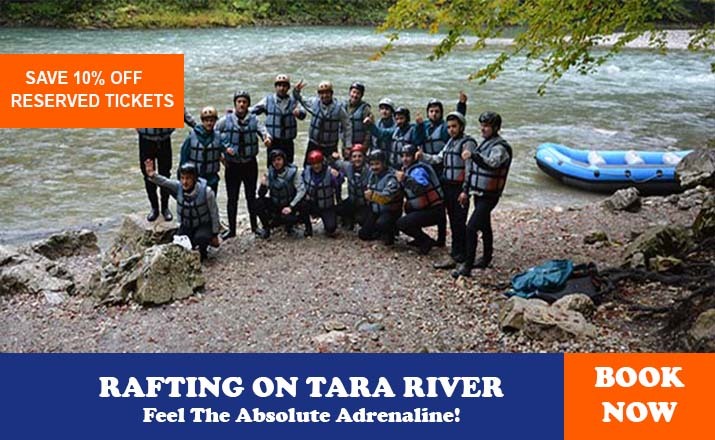 The river has its other face too with several sections where it speeds up and rushes thought several small gorges (the best known of which is Trifan some 5km downstream from Berane) that make it popular with rafters. With modern roads built across the mountain ridges the valley has lost some of its former importance but in previous centuries it represented a distinctive whole and played an important agricultural and commercial role. In the early Middle Ages it was a hub of Serbian state and there are several monuments bearing witness to this era such as Djurdjevi Stupovi monastery close to Berane or the church of Saints Peter and Paul in Bijelo Polje. Later on the region was taken by the Ottoman Empire for which it was an important transit zone towards Bosnia. The Ottomans remained here until 1912 and their influence is still widely encountered, most importantly in the numerous Slav Muslim population (Bosniaks) but also in many mosques of a specific mountain type that imitate the pattern of local houses with their steps shingled roofs. The area of Plav and Gusinje in the south of the region is and alpine looking valley at the foot of the Prokletije Mountains. Once prosperous trading spots, these two towns were plunged into bare survival by new borders which left them at the dead end of the road. Alongside Durmitor, Prokletije are the most fascinating mountain ridge in Montenegro: their sides rise steeply from the surrounding fields capped by hostile stone peaks which attract many mountaineers and alpinists. Much more spectacular than Lim is river Morača. In the first part it descends quickly between Mt Sinjajevina and mountains Žurim and Stožac forming a pleasant bur narrow dale crowned by the impressive Kapa Moračka (“Hat of Morača”) peak towering at 2226m. After passing Morača monastery, an excellent piece of art from the 13th c, the cliffs rise higher announcing the beginnings of the forbidding Morača canyon. The motorway and railway which run along the whole length of it provide stunning sights of its peaks and chasms. Equally impressive is the canyon of river Mrtvica which joins Morača from the right, impenetrable until a few decades ago and now one of the favorite routes of seasonal hikers. Between the rivers Lim and Morača flows Tara with towns of Mojkovac and Kolašin on its bank. The latter lies below Mt. Bjelasica and its quickly developing into a mountain and ski tourism centre. Bjelasica is widely known amongst nature lovers for its Biogradska gora National Park with beautiful Bigradsko Lake and deep pristine woods around it. At the far east of the country lies the small town Rožaje populated almost exclusively by the Muslim Bosniaks. With several good hotels the town offers possibilities for hiking in high mountains such as the imposing massif of Hajla (2403m) and even better for winter sports at its improving (and potentially huge) skiing resorts. Mrtvica River is the chief tributary of Morača, flowing in from the west near the village of Međuriječje. The small but potent Mrtvica forces its way between the step sides of mountains Maglanik (2,139 m) and Stožac (2,226m) forming a 9 kilometers long canyon. The average depth of the canyon is around 600m; however , if measured from the peak of Mt. Maglenik which lies 4km from the river, the canyon depth excels even the one of the River Tara. This hostile ravine has remained virtually inaccessible up until the mid 1980s when the army drilled through the rock in its side making it possible to track its flow for the first time in history. Since then, the spectacular canyon of Mrtvica has become one of the most visited mountaineering tracks in Montenegro but has remained unknown to the wider audiences due to its isolation. With its richness in trout and sprout the river also attracts the attention of anglers. The experienced once claim that angling here demands a lot of knowledge and patience since the fish is very wary. The wilderness surrounding the canyon of Mrtvica is captured in the very sound of its eerie name (mrtvo-dead). There are several explanations for it, all coming from the associations flared by its hostile looks, but the most convincing one is connected with the change of water quantities in it: though during springtime and early summer the river is very abundant in water fed by the snow melting in the mountains, as soon as this season is over (at the beginning of July) the river suddenly “dies” turning itself into stream not larger than a brook or even dries completely in its upper course. More vivid answers to the question are given by local legends. One tells that the river got its name after many dead bodies ended in its waters following a battle with the Turks, another that a great flood carried away everything from the village of Velje Duboko, even the dead in their graves. To reach the starting point for hiking from the direction of Podgorica one should pass the sign announcing the Medjurječje village on the Podgorica- Belgrade road and then look carefully for a red sign that directs you to the left. Be very cautious since the turn is of a sharp angle and has to be made at a busy road. The same turn is much easier from the direction from Kolašin. The walk through the canyon takes some 5 hours in one direction. The marked path starts from the confluence of two rivers, both remarkable for their clean, cold water. After some 15 minutes through the rich vegetation one reaches the Danilo’s Bridge (Danilov most) built by Prince Daniloin 1858 “for the soul of his mother Krstina”, as it is commemorated in large Cyrillic letters on a stone tablet. With its two arches high above the enchantingly green waters of the Zeleni vir (“Green Whirlpool”) it is certainly one of the nicest pack-horse bridges in the country (not being wide enough for a cart), not least for its unique setting. The bridge is a part of an old track that avoided the canyon and used to be only connection for several villages deeper in the mountains. From here the hiking trail climbs up through the greenery past the old mill and shortly afterwards reaches a gravel road. This road begins from the closed hotel “Medjurječje” and leads some two kilometers along the river to the homestead of Milivoj Bulatović where it ends. Passing these lonely houses, after a few minute walk one reaches the new, wooden bridge from which remarkable views along the river can be enjoyed. Further on and deeper into the canyon, where there is very little sunshine and where it’s always chilly, is the Bijeli Narini cascade famous for its beauty as the water bubbles and breaks on the rocks (note that this phenomenon is far from impressive in high summer). Continuing the hike on reaches the most attractive part of the canyon with the narrow path cut into the primeval rock rising vertically above the green river. 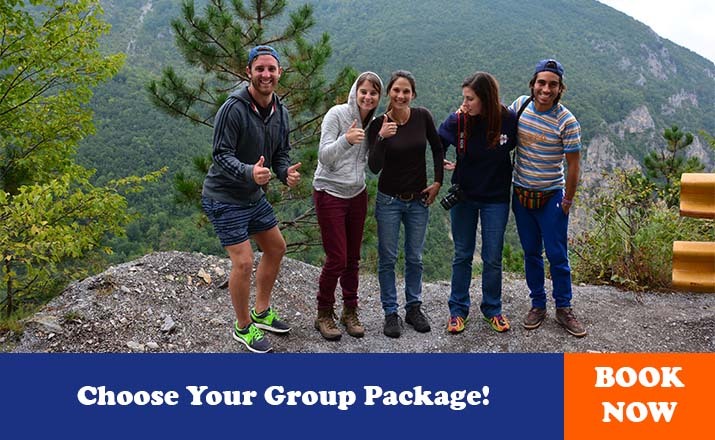 The tour ends in the village of Velje Duboko ( “Great Deep”) that has nested itself in a picturesque valley in front of canyon. The village, with small houses surrounded with walnut, plum and apple trees, is much needed break from the inhospitable conditions of the canyon. It is one of the chief villages of the Rovici clan that got its name from the looks of their settlements ( rovati-to dig into). Velje Duboko is a good starting point to reach Kapetanovo Lake high in Mt Žurim (6 km, 3 hours walk). The picturesque glacial lake lies 1,678m above the sea level a desolate place stripped of most vegetation and surrounded by a katun settlement. It is quite large (480 by 360 km) and has a distinctive, dark green, almost black water as a result of its depth (max.37m) that also keeps it cold throughout the year. From here it’s a half hour climb to the smaller Manito Lake underneath the top of Mt Stožac and 2 hour climb to the peak of Kapa Moračka (2, 226m overlooking the source of river Morača. The other way to reach Kapetanovo Lake is 5 hour walk from the Krnovo pass on the Nikšić-Žabljak road. 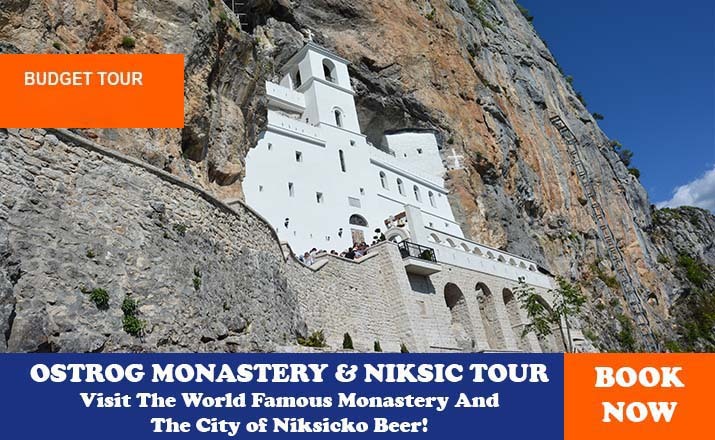 Morača Monastery is set in a spectacular position right at the beginning of the dreaded canyon of River Morača, in the very mist of the highest mountains of Montenegro. The position is further emphasized by the scenic Svetigora waterfall some 25m high, plunging noisily just behind the complex, making it one of the famous motifs on many pictures. 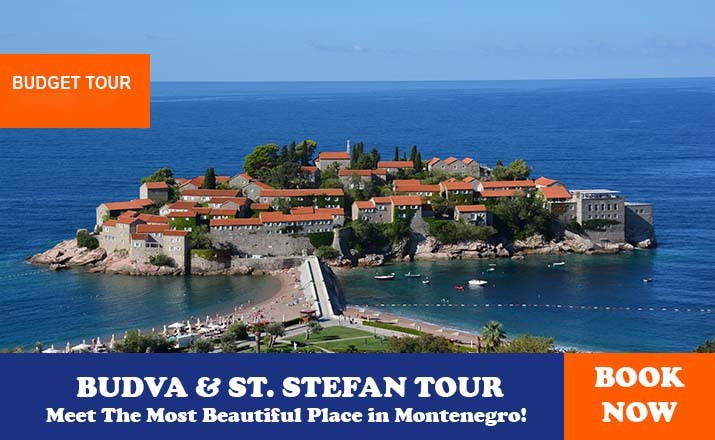 The monastery was founded in 1251-52 by Price Stefan, son of Vukan and grandson of Stefan Nemanja, the founder of the Nemanjić dynasty. 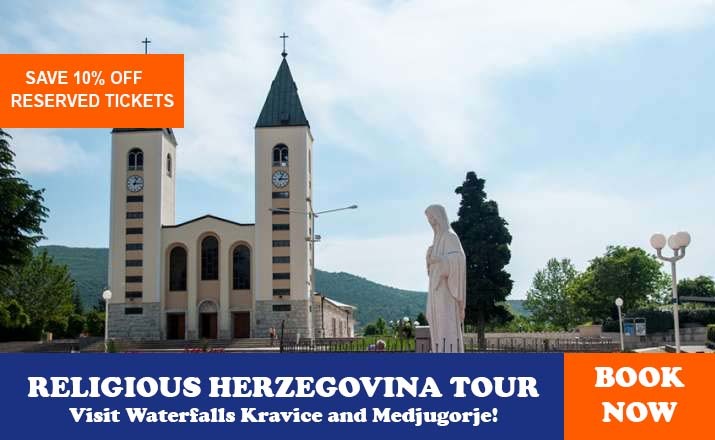 Its main church, dedicated to the Assumption is a fine example of mature Raška style of Serbian medieval ecclesiastical architecture-single nave with a narthex, cupola above the square base, semicircular apse and a chapel each side. The details, such as the main portal and the double windows, are clearly Romanesque and revival that the builders came from the town of Kotor. The monastery was looted ( including its cooper roof) and burnt down by the Turks 1504 and remained in ruins until the renovation of 1574 when the best Serb artists of the time were summoned to help. In the 6th and the 17th c. it became an important artistic and cultural centre and played important role in political life. Most notable of such evens was when in 1608 Serb patriarch Jovan came to the monastery to convene with the local clan leaders and request help from the Savoy dynasty against the Turks, but the scheme met with no response. In the 1877 war the monastery was site where the advancing Turkish army was stopped with a heroic defense led by its abbot Mitrofan Ban, the future metropolitan of Cetinje. The western portal of the Church of Assumption is made of dark stone and with somewhat naive representations of the Virgin Mary, Curcifixtion and beasts of hell. Above the door is the original inscription by the patron and fresco of the Virgin surrounded with angels. This painting is one of the rare surviving medieval originals as almost all other frescoes here date from the time of the renovation by copy the themes represented by the destroyed medieval ones. The western front of the church is additionally decorated with now blanched wall- paintings including the large representations of the St Demetrios and St George on horseback. These frescoes as well as those in the narthex date from 1616 and are the work of Georgije Mitrofanović who was invited the famed Monastery of Hilandar on Holy Mt Athos. Before you enter notice the fine door from the same period, influenced strongly by the contemporary oriental arts. The most impressive compositions in the narthex are the huge Tree of Jesse on the north wall, Last Judgment as well as the Christ sitting on the throne in the composition known as the “Emperor of the Emperors”. The walls of the nave were painted by priest Strahinja of Budimlje: the Dormition of the Virgin, see above the door, and scenes from the life of St Elijah on the north wall. One of the rare surviving original frescoes from the 13th c. is the “Ravens feeding Saint Elijah” hidden in the diaconicon ( to the left of the altar), regarded by many as one of the masterpieces of its time. The frescoes of the Annunciation and the Deisis are from the same period. The splendid iconostasis, with remarkable large icons and the gilded crucifix that alone took 11 years to carve, dates from the very beginning of the 17th century. One should also note the portrait of Vukić Vučetić who led group of locals donors who paid for the renovation. In the church are displayed some of the monastery’s many valuable icons such as those by the painter Jovan: one portrays St Sava and his father S Simeon (Nemanja’s monastic name), with the life of St Sava depicted in the smaller pictures around it; similar to it is the one representing St Luke painting the icon of the Mother of God, in which one can also see the construction of the monastery. The small chapel to the left of the narthex is dedicated to St Steven, protector saint of the Nemanjićs and of Prince Stefan. Its excellent frescoes are also the work of painter Jovan from 1642. Among them the most important is the one depicting St Stefan leading the patron (carrying the model of his church) to the Virgin. The small Church of St Nicholas, lying closer to the entrance of the monastery compound was built in 1639 on the foundations of the medieval tower which once guarded the gates. The monastic tradition holds the church to be even older that the main one, but this was probably invented at the time of construction as building of new churches was prohibited in the Ottoman Empire. Its frescoes dating from 1639, work of painter Jovan, rank amongst the best of their time. The main subject on its walls is the life on miracles of St Nicholas, displayed with some interesting iconographic solution such as the scene “St Nicholas saving the boy from the Saracens” in which the Saracens are portrayed as Turks dressed in contemporary fashion and seated alla turca on an oriental rug. In other frescoes the saint helps the seafarers, gives sight back to Serbian king Stefan Dečanski and introduces Prince Stefan to the Mother of God. Also notable are the frescoes of St Sava and St Simeon as well as the large composition of the Assumption above the entrance. Not a long way up the river is the Monk’s Bridge (Kaluđerski most). This half ruined piece of amateur engineering was built monastery fraternity in 1842 at the point where at the river gets very narrow. One of its arches collapsed and was replaced by a wooden construction, which still stand giving it a hazardous look, but is nevertheless still in use. Travelling from the seaside and Podgorica, Kolašin is the first town in the monuments you will come across. 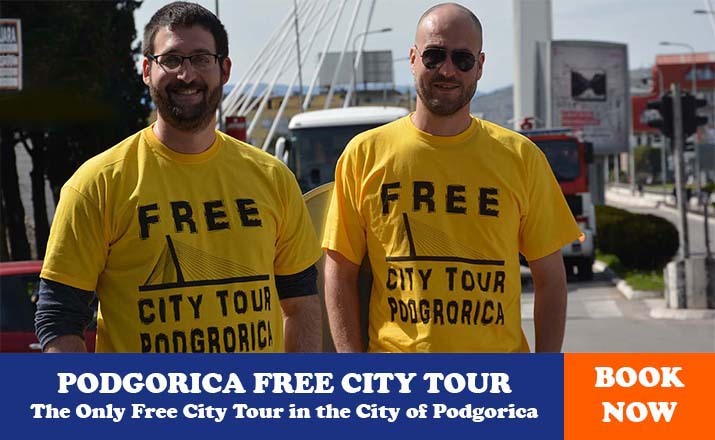 Just an hour’s drive from Podgorica makes a world of difference: at the altitude of 965m, the climate here is much colder while the forests around the town generate a pleasant cool breeze. The hottest summer days are easy to bear, while in the winter there is plenty of snow of the mountains. The position of the town is fascinating as well: It lies on a plateau between the mountain giants- Bjelasica on the east and Sinjajevina of the northwest. The same plateau is the watershed between Tara that continues northward and Morača that descends to the south. All of this creates potential for Kolašin to become a perfect weekend break for people from the capital and a town with the most promising future in tourism.The town was founded in the mid 17th c. as a Turkish military outpost in the middle of the rebellious clans of Bosna and Herzegovina. Therefore its history in the next two centuries was comprised of almost innumerable Christian raids on the town and Muslim efforts to submit the highlanders. Since most of the residents of Kolašin where coverts to Islam from the very same clan they fought against, the fighting was fierce and ruthless providing epic singers on both sides wrights it lots of heroes and their deeds. The town was annexed by Montenegro in 1978, the Muslims moved out and Kolašin started all over again. The central square and couple of streets around it were all that was created in its slow development. Disregarding its potential, Kolašin is still just a small mountain town whose sleepy atmosphere is broken only by lively cafe life in which skiers and mountaineers mingle with the locals. The central square, Trg Boraca, is the focus of town life. Its edges are formed by one-storied houses whose stoic appearance warns of the long harsh winters. In its centre is the social-realist monument to the fallen in WWII and behind it a modernist edifice if the local town council that with its sharp angels imitates the rooftops of the neighboring houses. Next to the small hotel “Brile” is the seat of the National Park “Biogradska Gora” that covers the most magnificent part of info-center one can obtain maps and souvenirs. Close by is also the tiny Town Museum with an ethnographic collection of the region, collection on history prior to 1941 and the section on the partisans in WWII. 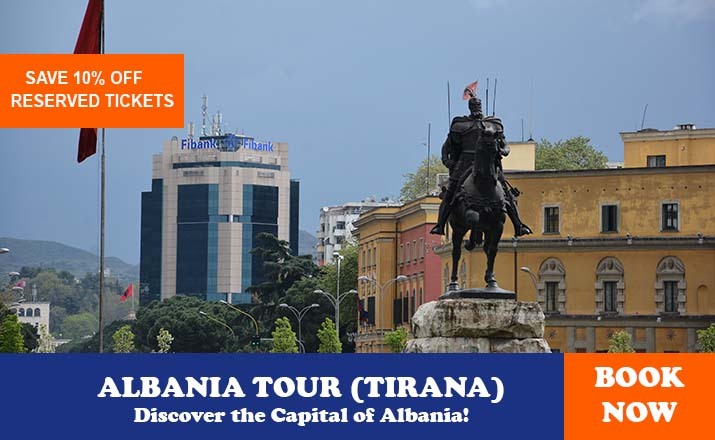 On the farther side of Trg Boraca stands the tall hotel “Bianca”, pride of the local tourist offer and the classiest meeting spot in town. On the other side of the square is the Četvrte proleterske Street in which most of the towns cafes are concentrated. At the end of the street is another small square and then to its right a mound on which the town church built shortly after 1878 stands. The most unusual attraction in Kolašin is its Botanic Garden “Dulovine” on the southern outskirt of the town. The garden is privately owned and quite small so it doesn’t stick out the other houses. To find it go past the rear of the train station, then past the pine woods and then watch for the sign- the Garden is one of the houses to your left. The owner any your guide through the garden is the amazing Daniel Vincek, enthusiast and Montenegrin mountain buff since he came here 40 years ago. 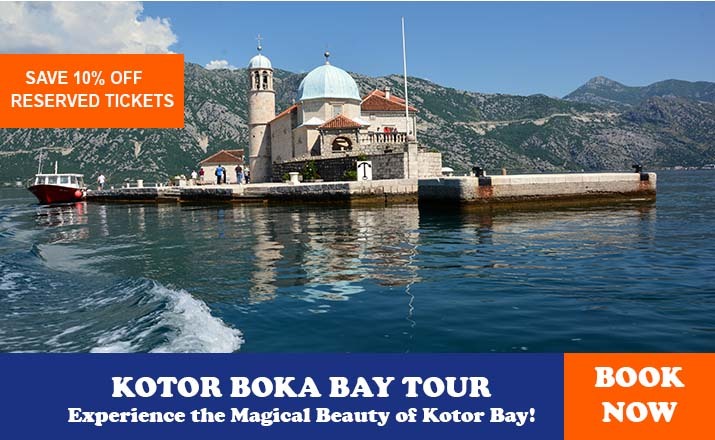 His botanical garden presents the flora of continental Montenegro with many rare and endemic species whose life and peculiarities are brought to life by Mr. Vincek’s stories. Holding a central position in East Montenegro, this giant of the mountain can be seen from all around. Its main ridge spans 29km from Mojkovac to Andrijevica with its highest peak being Crna Glavaat 2,139m. The mountain got its name after the snow-caps on its tops which remain gleamingly white (bijela) during the most of the year. Eastern part of the mountain is protected as the “Biogradska gora” National Park with Biogradsko jezero Lake as its central and most easily accessible feature. To reach it look for a green sign announcing the park some 14km from Kolašin in the direction of Mojkovac; take a right turn immediately after the sign across a narrow bridge. The road climbs 3km through a deep virgin forest where trees as tall as 60m and up to 500 years old block almost all sunlight. 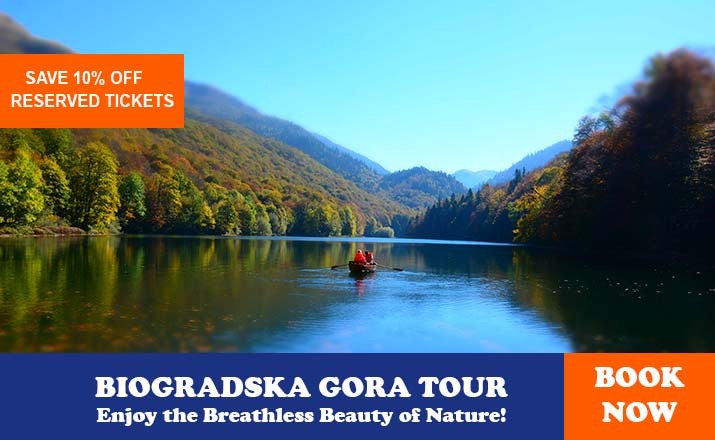 The road ends on the shore of Biogradsko jezero (1,094m) with is tranquil green water surrounded by unspoiled forest of unspoiled forest of maple, birch, fir and 84 other tree species. Here one can find souvenir and the map shop a restaurant and several small cabins that can be rented. On the shore of the lake of the lake is also a pier with boats for rent. The lake is surrounded with a 3,5km long trail suitable for easy, relaxing walk passing over several bridges and pontoons snaking across many streams feeding the lake. Fishing is allowed but only on Tuesdays and Sundays with a proper license. The catch is limited to three pieces. Fishing on the other lakes on Mt Bjelasica is not allowed. Ski center Jezerine is located some 8 km to the east of Kolašin. A rather bumpy road leads to a spacious parking lot. The center has five ski-lifts, one double chaired, three gondolas and a baby lift with one gondola working also in the evenings. 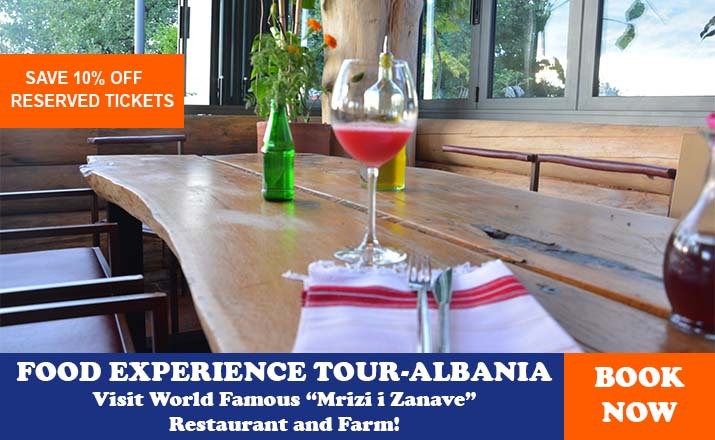 There are also two restaurants here offering a range of cooked dishes at slightly higher prices than in Kolašin. The ski slopes of Jezerine are well kept and can be quite demanding with some descends reaching the gradients of up to 60 degrees; for the less experienced there is mid-way station. The town of Berane is the centre of Upper Lim valley. 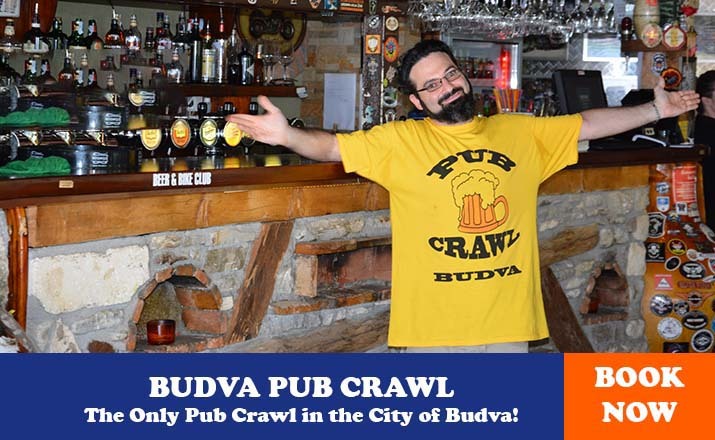 It lies in the region known since medieval times as Budimlje, a prosperous country that lay in the middle of the medieval Serbian state. 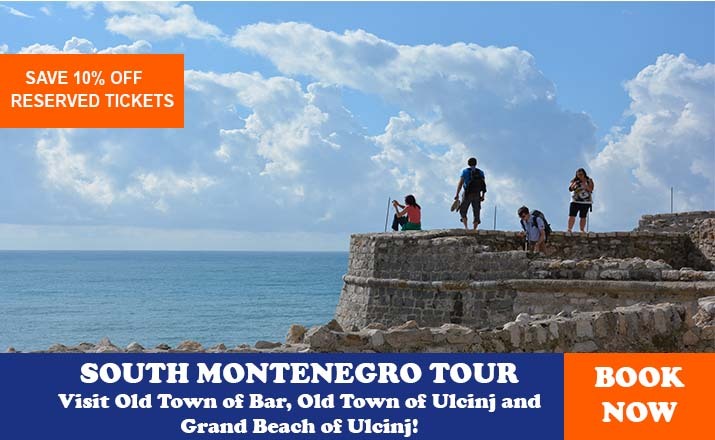 The town itself is actually the youngest in the whole of Montenegro. Its beginning lies in the year 1862 when the Turks built their barracks in the field near the village of Beran to watch over the region of Andrijevica, won by Montenegro in 1860.The town grew around officers’ houses but the orthodox population did not settled in longer numbers until its liberation in 1912 when the Berane became the seat of district and got a high school, the only such institution in this part of the country. From the 1949 to 1992 the town was renamed to Ivangrad after Ivan Milutinović, one of the leading communist and leaders of uprising in WWII. The sign with the old name can still be seen on some old notice boards so don’t get confused. Though quite large, Berane is uninteresting apart from the weird blend of oriental neglect witnessed in crumbling old houses, socialist blocks, streets sellers as well as utterly chaotic driving. The man street, Igumana Mojsija Zečevića, is a wide pedestrian promenade filled with cafes. At its upper end is a square with the seat of the local community. Facing it is the House of Gavro Vuković, local chief and the first minister of foreign affairs of Montenegro, which was built in 1913 in a modest variation of current European fashion. To your right is the building housing the Polimski muzej with an interesting collection of archaeological, historical and ethnographic items. The most interesting are 14th c. chain mail, old firearms and costumes from the Lim region. By far the most interesting monument in Berane is the Monastery of Djudjevi stupovi ( “George’s Towers”) the seat of the orthodox bishopric. 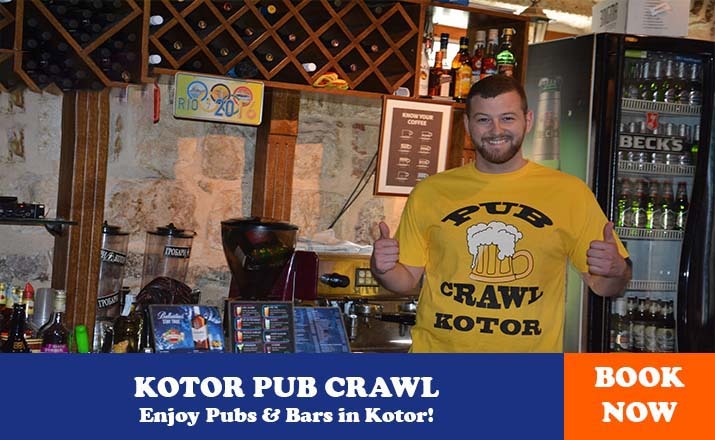 It is located on the western outskirt of the town: follow the sign to get off main road to Andrijevica and then take the third street to your right. The church dedicated to St George was built at the end of the 12th century by Župan Prvoslav cousin of Stefan Nemanja. Unusually long but nevertheless harmonious church is a result of three building stages. The part with a cupola is the oldest and was done by maritime builders, which were preferred by the Nemanjićs. The higher part with a belfry was added around 1219 when St Sava established here one of the seven bishoprics of the newly founded autonomous Serbian church. Originally the edifice boasted not one but two towers, the feature that earned it its name. On the west side the church ends with the outer narthex from the 18th c. The interior is plain and comprises only a few centuries survived five annihilations of the monastery. Djudjevi stupovi was an important centre for local Christians, especially of the Vasojevići clan. It was here that in 1829 abbot Mojsije Zečević led the assembly that revised and adopted collectively the traditional clan laws. This seat of commandments known as Vasojevićki zakon, presents a short, easily comprehensible and merciless rules of survival in those cruel and lawless times. Some 15km to the east of Berane is Mt Cimljevica (1963m) under which is located the ski-centre Lokve with a freshly reconstructed hotel of the same name and three ski-lifts leading to five skiing paths. Gusle is a Serb national instrument of ancient origin similar to a fiddle but with only one string ( or exceptionally in some areas, two strings) where the sound is produced by pulling the bow over the string while holding the instrument in one’s lap. The created sound is sharp, dramatic, almost unpleasant and-contrary to the looks-it takes a lot of skill to make it. But the sole sound of gusle is not important on its owns as it is always accompanied by singing of the guslar. His chant is a kind of lament repeated over and over, highly intonated and hypnotic, more a recitation than a real song. This comes from the fact that with gusle one always singes epic songs, telling the deeds of heroes and heroic acts and it has been so for centuries. The oldest songs accompanied by gusle come from the Middle Ages and sing about Kosovo Battle and the legendary hero Kraljević Marko. Their glory days were during the times when they replaced both books and newspapers for the poor and illiterate peasants, singing about the lost freedom of the Serbs and encouraging men to new heroic acts. The instrument and its songs are still alive today, telling stories of current events from its own, archaic point of view. Guslarske večeri, the “Evening of guslars” are still a usual kind of pastime in many towns and guslars are still highly revered and appreciated. In Montenegro it is almost impossible to image a home without a family owned gusle hung on the wall, usually richly carved with interesting national symbols, mythological or historical representations. 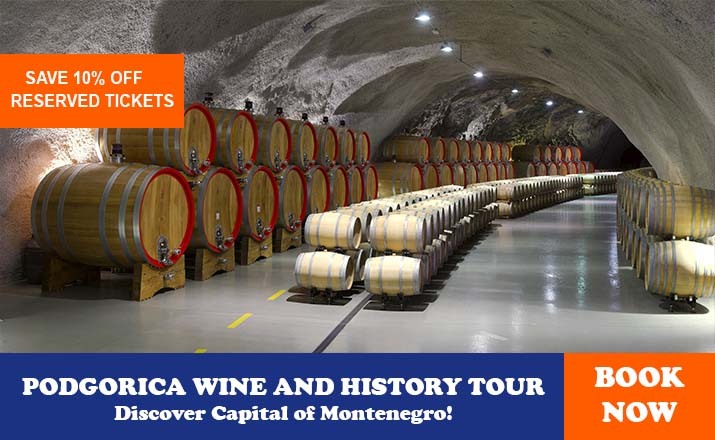 If visiting Montenegro by car, it is almost impossible to miss this town that owns much of its prominence to the Podgorica- Belgrade road which passes through it. This “White Field” in the valley of the Lim River which was named after its abundant daisies (bijela rada) was well populated already in the Middle Ages. 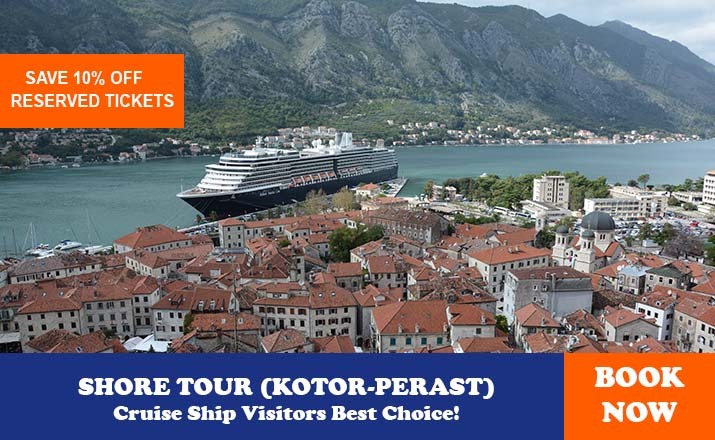 However, the town itself appeared first in the late 16th c. as a trading post next to the monastery of Nikoljac and was initially called Nikolj-Pazar, but this name gave way to the name of the field in which it spread. The face of the oriental small-town changed drastically during the days of socialist Yugoslavia when it was industrialized and rebuilt to a great extent. Today, it is best known for the sparkling mineral water “Rada” which is drunk all over the country. The best known historic monument of Bijelo Polje is the Church of Saints Peter and Paul (Crkva svetih Petra i Pavla) that lies immediately to the left of the main road from Podgorica towards Belgarde. This unusually looking small church was built in 1195-99 by prince Miroslav, brother of Serbian ruler Stefan Nemanja, who governed a region from here to Dubrovnik , known at the time as Hum and later Herzegovina. When in the mid of 13th century the seat of bishop of Hum was transferred here, the church got its two high towers (25m) an obligatory element of cathedrals. After the Turkish conquest the church was turned into a mosque , one tower was pulled down while the other was kept as a minaret. It remained a Muslim shrine until 1922 when it was returned to the orthodox community. This is tiny church of odd shapes has a rectangular apse and a blind dome and is the earliest example of western pre-Romanesque tradition in Orthodox architecture, a clear sign that it was constructed by builders from the Adriatic coastline invited here by prince Miroslav. The main stone portal still bears the original Cyrillic inscription with prince Miroslav’s dedication. Only a few fragments of the original fresco-painting remain to this day. The one just to the left of the entrance is by far most important: here we see the remains of the portrait of prince Miroslav, with the model of the church in his hands. By using this image the modifications on the interior walls: even a mihrab, a niche designating the direction of Mecca, still endures on the right hand wall. The few remaining frescoes were painted around 1320 and are fine examples of the monumental style prevalent in Serbia at the time. Church of St Peter and Paul is also known for its connection to Miroslav Gospel (Miroslavovo jevadjelje, a 12th c. illuminated manuscript written on the others of prince Miroslav for this church. The Gospel is one of the oldest examples of the Serbian redaction of the Old Church Slavonic languages and contains 300 splendid miniatures from Byzantine and Romanesque tradition. During the centuries it was kept in the Serb Hilandar monastery on Mt Athos, it was then carried by the Serbian army in WWI to Greece and is today kept in the Belgrade’s National Museum as one of its most valuable works of art. The town’s centre is a square with a pleasant park highlighted by a social realist monument to the fallen in WWII. The main town street, the pedestrian Ulica Slobode, branches from the square. Of the lower side of the square begins a small street in which one can see the recently reconstructed House of writer Risto Ratković, the nicest example of oriental architecture in the town. Regrettably, the house is closed for visits. One block above the square lies Radnička street with its Local Museum (Zavičajni muzej) located in the white washed house (1905) of the old high-school. In the museum one can see Neolithic artifacts found in the surrounding area, an interesting example of a plough from the Roman era, medieval weapons various folk costumes, numismatic collection (mostly Roman, Medieval Serbian and Montenegrin coins) and finally documents, photos and weapons from WWII. The other ecclesiastical monument of Bijelo Polje the Nikoljac Church lies on the opposite side of the town from St Peter and Paul’s. The church which once belonged to the monastery of the same name was built around 1560 and was one of the largest Serb churches constructed under the Ottoman rule. Its form is one of basilica with three distinctive parts and large octagonal cupola. Apart from the faded frescoes on its western façade the rest of the exterior is plainly painted in white while the roof is covered with gray shingles. The interior, on the other hand, is on the most impressive in the whole of Montenegro since it completely covered in frescoes from the late 16th c. The frescoes depict the cycles of the life Christ, the life of St John and Baptist and the miracles of St Nicholas but also some unusual scenes such as the eternal suffering of sinners (to the right of the entrance) amongst them a dishonest innkeeper and a miller with the tools of their trade hanging from their necks. The highlight of the church is without a doubt its splendid iconostasis: opulently carved and ornamented in gold, with an inspired work of crucifixion surrounded with seemingly free standing starts and angles as well as number of exceptional icons dating from 16th to the 19th c. The most interesting of these icons in the one of St Nicholas with scenes from his life, painted by Radul, one of the most talented icon-painters of his day. Note also the unusually tall 16th c candlestick of white marble standing in front of the iconostasis. The miniature shanty town lies on a small plateau overlooking the river Lim. 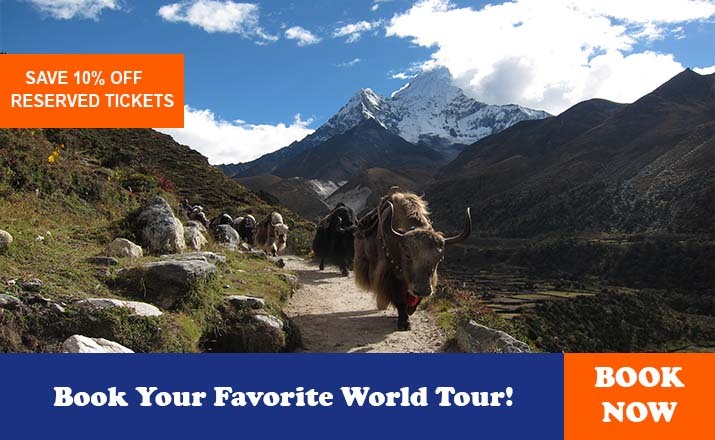 Even at its height of 800m above sea level it is still overshadowed with high mountains covered in deep green forests. In the Middle Ages a church was built here by Andrija, a prince of the offshoot branch from the Nemanjić dynasty. His church called Andrijevna survived until 1765 when it was levelled to the ground during a Turkish punitive expedition against the Vasojevićki clan, which inhabits this area. When Montenegro acquired control over the Vasojevići in the mid of 9th c, the ground of the valley of Lim, where previously stood Andrijevna Church, became once again an interesting site for a centre of a rural region which had no other town at all grew one house at a time. Between the two World Wars it grew even faster as the seat of large country was located here. This continued until in 1960 all of the administration was transferred to Berane or Plav and the town started slowly to die out. All the town’s amenities are located in its main street which also serves as the road from Berane to Plav. Side by side stand half-ruined houses of traditional design with white-painted walls and shingled roofs, socialist apartment blocks and half finished family houses of newer origin. In front of its few shops one can often see small mountain horses patiently waiting for their master to finish his shopping. 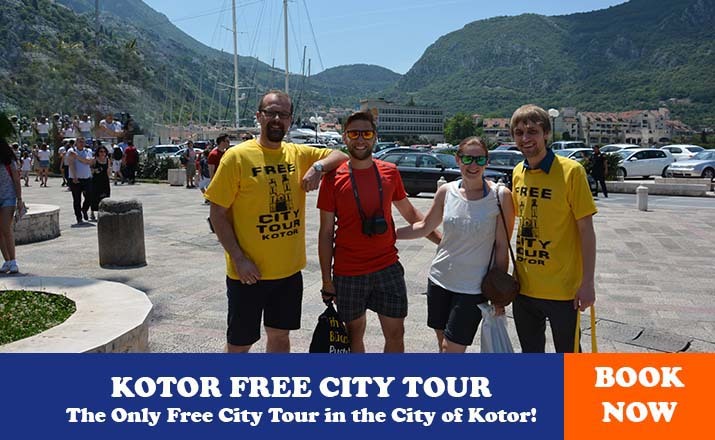 However, even such small backwater town is undoubtedly the most important settlement around and is therefore a convenient place to stop for supplies before beginning a trip to the mountains surrounding it, the most notable amongst them being Komovi. The only historical monuments in Andrijevica is Knjaževac , a nice park whose main feature is a stone church built by prince Nikola in 1887. Facing it are two monuments: the smaller one with an eagle atop erected in memory to the fallen in 1912-1918 wars while the other, more abstract commemorates the inhabitants of the area who died in WWII. 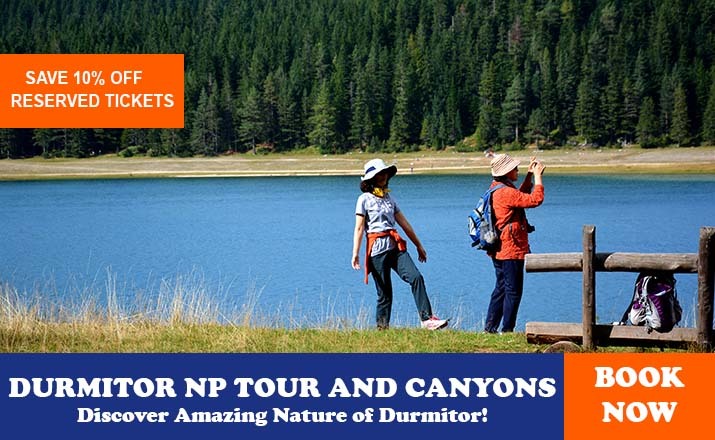 Together with Durmitor and Prokletije massif, Komovi is one of the most impressive ranges in Montenegro and indeed in the whole of the Dinaric Alps. The mountain is bordered with Tara to the west and Lim to the east from where it ascends to 1900 meters, where a series of smaller plateaus above the forest level make it perfect for katuni, the shepherd’s summer houses of, which are remarkably almost all still in function.From the tableland rise to the bare rocky peaks- Kom Kučki (2487m) to the east west and to the east Kom Vasojevićki (2461 m) both named after clans whose mutual border they form. Komovi are easily accessed by Andrijevica-Kolašin road that winds upwards to Trešnjevik pass, recognizable by the small inn of Savo Lekić. Here you cans sip a drink taste a game delicacy, get information about the area or just enjoy the merry company of the locals. From this point a 6km long gravel road branches out leading to the idyllic grassland plateau of Štavna with shepherd huts and freely grazing flocks of sheep, cows and horses. This is also the location of the ”Eko katun”, a new complex of ten huts, each with five beds with all the luxuries of civilization.With its wide vistas to the south and its relative flatness, Štavna is a perfect place to pitch your tents.The rugged, inhospitable looking and in some places almost vertical sides of this mountain are a real challenge for climbers. The climb to Vasojevićki Kom (2 and the half hours) is somewhat easier, while the one to Kučki Kom (3 and the half hours) should only by attempted by experienced climbers and is best achieved from its south face.There is also nice circular walk around both peaks: from Štavna to Ljuban ridge, then to the source of Crnja river, then below Kučki Kom to the Carine katun at the southern face of the mountain and back along the eastern side. Following a slow pace, the walk will take you a whole day. The small town of Plav has most spectacular setting: it lies 900m above the sea level near a large lake at the east edge of a brad and fertile valley which is bound on all sides by high mountains. 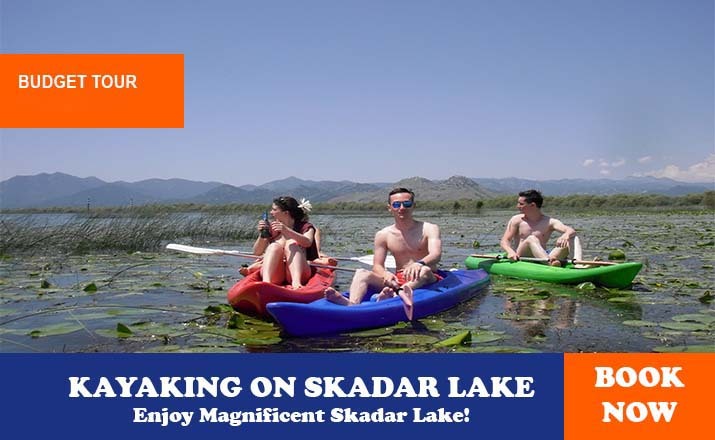 Before reaching the town one first observes the Plavsko Lake, the largest and the most beautiful of several glacier lakes of the Prokletije Mountains which are mirrored on the surface. The lake is almost 5km wide with its deepest at 9 meters. Its always cold waters have a dark blue (plavo) colour, which offers, one of the explanations for the town’s name. The lake is fed by the water from the River Ljuča coming from the west while from its northern end Lim, the longest river in Montenegro, flows out. Plavsko Lake is very rich in fish, especially in trout, huchen and grayling. The shores are covered in reed and there aren’t many places suitable for swimming apart from the wooden pier on its east side. The town of Plav was first mentioned in the 13th century as a village of fishermen in possession of Serbian kings that kept the monopoly on the fishing here. Additionally, it functioned as a commercial centre on the busy road from Podgorica to the Lim valley. Plav developed further after the Ottoman conquest in the mid 15th century and especially at the beginning of the 17th c. when it got a small fort and a permanent garrison; it was during this era that most of the population converted to Islam, the religion still practiced by most of the locals. 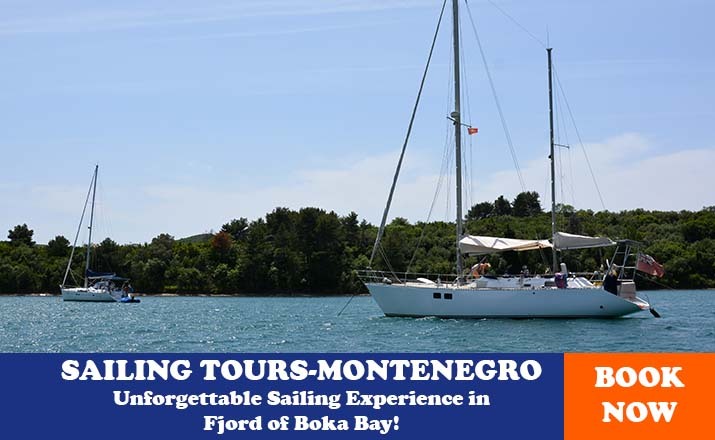 The place lived its life of seclusion until 1878 when, by the word of the Peace treaty of Berlin, this area was supposed to become a part of Princedom of Montenegro. The local Muslims rose to arms against this decision and after fierce resistance managed to reverse the decision and stay in the Ottoman Empire. Nevertheless the old Empire’s rule came to an end in 1912 when the Montenegrin army seized the area. Unfortunately for the region, the newly formed Albanian state got a small portion of the old road to Podgorica and thus Plav was denied its most important route, left with only a single road leading towards the north. This was the beginning of the end for this area which became known for its high emigration. Today most of the people born in Plav live abroad and the town gets alive only during their summer vacations when they return to see their relatives. Though it consists mostly of new houses the town’s physio-gnomy is still very oriental. At the entrance to its centre is a small roundabout with a post office. On a small mound to the right is Plav’s most important sight, the Old Mosque (Stara džamija). Made in combination of wood and stone this typical mosque of the western Blakans was constructed in the mid 18th c. on the site of an older one. The mosque’s porch has some fine carvings. To the left of the roundabout opens a view of the large Imperial Mosque (Carska džamija) constructed in 1909 with the donation from the Sultan Abdul Hamid II, thus its name. In 1924 the mosque was turned into a warehouse, later into a school and even into police station and has only recently been returned to its original purpose. From the roundabout starts the narrow čaršija, the main trading street where most of the business and institutions are located. At its end take street to the right and walk past another small mosque with a nicely carved wooden minaret to reach Redžepagić Tower, standing tall in the middle of the courtyard outlined by family homes that surround it. The tower is probably the oldest building in the town, dating from the late 16th or early 17th c. The first two floors are made of stone and are about one meter thick, while the wooden top floor with a typical steep roof was added somewhat later. The towers such as this one were built by local landowners to serve as their homes which could easily be transformed into impregnable forts. If you look closely, you will notice that several other houses around here are in fact adapted towers. Plav is convenient starting place for excursions to the mountain Kofiljača and Bogićevica spreading to the south of it. There is a marked route leading to Kofiljača’s highest peak Horolac (2199m) starting from Bogajiće village, immediately to the south of the town. The walking tour lasts approximately 3 hours. In a spectacular setting in the heart of the wilderness of Mt Bogićevica at the height of the 1960m, the Hridsko Lake (Hridsko jezero) is located and surrounded with Macedonian pine wood. One can drive to the village of Babino Polje (12 km to the east of the town) but to continue beyond one needs a four-wheel drive vehicle. Alternatively, a walk to the Lake will take you some two hours from Babino Polje. Prokletije (litarally “Cursed Mountains”, in Albanian Bjeshët e Nemuna) is the southernmost ridge of the Dinaric Alps. In a wider sense these mountains stretch from Shkoder in the west to Peć in the east, spreading through three states- Albania, Montenegro and Kosovo - and representing natural borderline between them. However, their name suggests a somewhat different view: they were considered “cursed” by the shepherds for their inaccessibility, lack of water of pastures, in fact they were unsuitable for any kind of life-these extremely rough conditions can only be found in the area south of Gusinje, which is considered to be the core of the Prokletije ridge. This part of Prokletije is the most impressive, its wilderness and the other size of its jagged stone cliffs make it a terrifying proposition. This is also where the Prokletije’s highest peak, Maja Jezerces (Jezerski vrh), 2694m, looms. The massif is ideal for hiking and alpinism and although it lacks facilities and many marked paths it offers a feeling of discovery and walking off the beaten track. 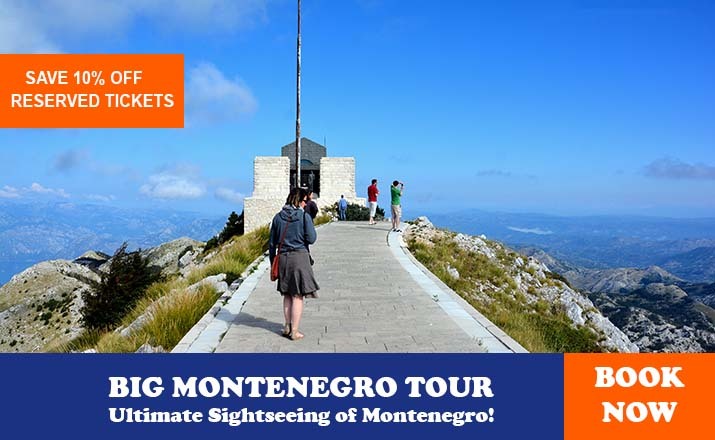 Moreover with their alpine meadows, peaks rising towards the skies and marvelous panoramic views, Prokletije are an astonishing sight even for those who are not attempting to climb one of its peaks. 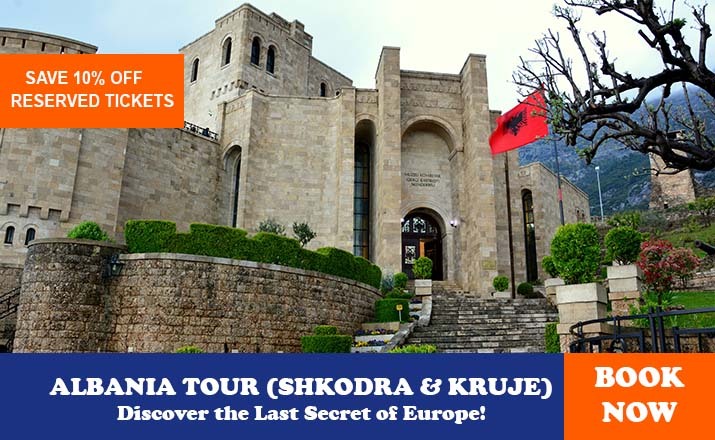 Located in fertile valley underneath the craggy Prokletije Mountains with Albania being behind the first peaks to the west and the south, Gusinje finds itself at the end of all roads. This tiny town once had much more importance as it lay on the road to Podgorica. In the 18thc. it was the seat of a country and had 600 houses with 200 shops, but since in 1912 the road was served by the borderline that town lost its importance completely and in the last forty years it dwindled the half size. The best known monument in Gusinje is the Vizier’s Mosque (Vezirova džamija) structured in a typical local style and built at the end of the 17th century by Mehmed-pasha Bushati, the Turkish vizier of Shkoder (today Albania). Curiously, the graves of the town’s fallen communists are located in the mosque’s yard. If you take a short walk a short through Gusinje you will notice many fine example of Balkan-oriental houses and some of the towers also, but all in a state of utter neglect. It is interesting to notice that small place has catholic and an orthodox church as well. The most famed spot for picnics in the vicinity of Gusinje are the illustrious All-pasha’s Springs (Ali-pašini izvori) 2 km to the south of town. In this remarkable place one has an impression that water is coming from all sides carried by number of streams and spilling all over the field. The streams remain cold throughout the year as they provided with water from the melting snow-caps. The spring got their name after famous local hero Ali-pasha of Gusinje, who led the resistance against the Montenegrin annexation of the area in 1878-81. On every August the 2nd, on the day of St Elijah (Ilindan), all people originating from Gusinje gather here in celebration, a spontaneous outburst of folklore, sorrow for the homeland left behind a display riches gained abroad (mostly in the USA and Germany). 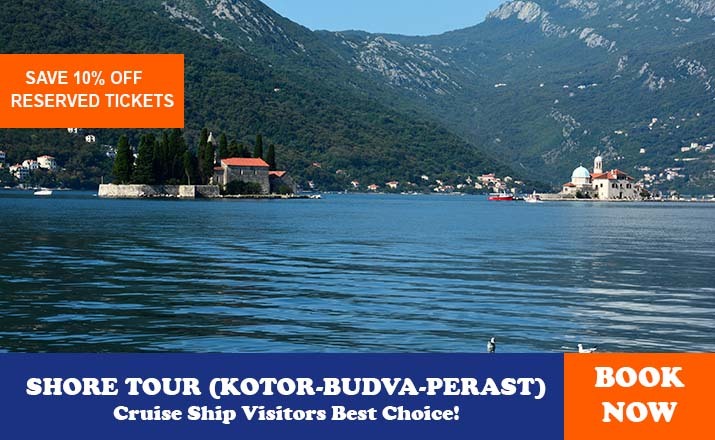 Rožaje is the centre of a mountains region in the far east of Montenegro. It lies in the valley traversed by the fast and cold river Ibar which springs nearby, along which passes the road leading to Novi Pazar in Serbia. In the town a road branches off and leads across the snowy Kulina pass descending towards Peć in the region of Kosovo. 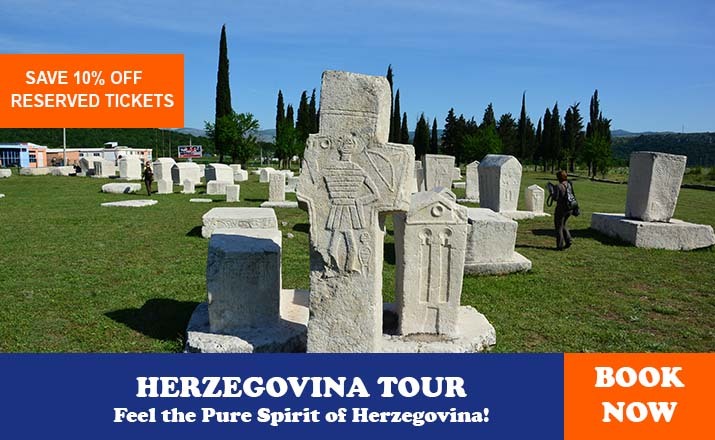 The town was first mentioned in the 17th c. under the name Trgovište (“Market”) as the peasants from the surrounding mountains came here to sell their meat, skins and dairy products and this tradition continued until not long ago. The name Rožaje, coming from the two crags rising above the town which reminded of horns (rogovi), was used simultaneously with Trgovište but became official only after the town was incorporated into Montenegro in 1912. At the end of the 17th century the orthodox population had to flee because they sided with the Austrians and against their Turkish masters the area was gradually resettled but this time all the newcomers had to accept Islam and the whole area remains almost entirely Muslim to this day. There a little left to witness the town’s history. Until a few decades ago its most lovely feature was multitude of surviving old houses with high shingled old houses with high shingled roofs but today you will find only a few of these, most in ruined state, while the rest of the town has been taken by tall new houses of strange post-modern shapes and colours. The most important monument is the town is the Ganića kula, a tall tower built in 1802 by local landowners to serve as an easily defendable home. When the reconstruction works end, it will house the eagerly expected local museum. There are two old mosques in Rožaje: the older one, Kurtagića džamija, dates from 1697 but following its incompetent bears little signs of antiquity; on the other hand Kučka džamija though much younger (1830) retains the features of traditional architecture. Of much more interest that the town itself are its environs-Rožaje is surrounded with magnificent range of mountains such as Cmiljevica (1,963m), Hajla (2,403m) and Žljeb (2,155m) to the south and Turjak (1,573m) to the north. The lower regions are hidden in thick forests while above them rise stony peaks attractive for hiking or even free climbing. The area us well known for its abundance is mushrooms blueberries and many rare and endemic flowers. Following a trail along river Ibar in the southwest will lead you to its beautiful springs (vrelo Ibra), where six pretty streams join to form the river that will continue for another 272km until its confluence in West Morava. Located just 4km from Rožaje on the highway towards Berane is the ski-centre Turjak with a hotel of the same name and two lifts.